You couldn’t forget that Halloween is coming up even if you wanted to. Everyone’s posting costume ideas, party ideas, Halloween ads are all over the place, stores are all decorated with skeletons and cobwebs. And then there’s the candy… If you’re looking to save money on costumes you can always swap with a friend, recycle from years past, or go the DIY route, but what about candy? You don’t want to be the house with the cheap candy, or the house that runs out of candy, or the house that only has the weird off-brand candy, so how do you keep Halloween candy from creating a huge hole in your budget this month? You follow these tips, that’s how! Stores want your candy business, even if they have to give you a discount to get it, so look for those coupons and use them! Lots of stores have buy more deals, like buy one get one, or buy two to be eligible for a discount, and even though it might seem like you’re being bamboozled into buying more than you need, most of the time you will actually save money if you take advantage of these deals. And come on- more candy is always better! You don’t want to take the chance on running out and looking bad in front of the neighborhood kids, do you? 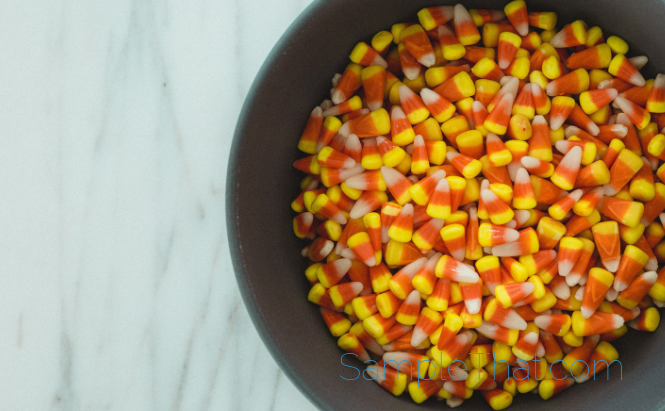 And if you’re stuck with too much after Halloween, check out this post for some cool ways to use your leftover candy. Wait! Hear me out! I’m not saying opt out of all the fun altogether, but what if you gave out little toys or games instead of candy? You can find many websites where you can buy cute party favors, or check out your dollar store for some ideas. I bet a lot of parents will thank you! Buying big bags of one type of candy can save money compared to buying an assortment of smaller bags. Buy just one small bag to start off, but as the night goes on you can just give out extras from earlier parties. This way you won’t have to stare down bags of candy for weeks after Halloween. Bake your own cookies, brownies, or cupcakes to give out to trick or treaters. If you can handle waiting, that’s the time to score the best discounts. Seriously! Do an inventory of your own candy stock before you go to the store, and you might find that you already have what you need. Save yourself a trip to the store, as well as the expense of extra candy.